Is it an insatiable craving or addiction?? I have stopped counting after 10 visits this summer, and with 3 meals from Jimmy John's Gourmet Sandwiches in the last 3 days, I am beginning to wonder is it an insatiable craving or rather an addiction? Can I survive without it? Have they slipped something in it to make you come back like a crazed coffee addict seeking your morning fix? In any event, I enjoy a #4 or #12 and at T.T. 's suggestion delete the mayo and add mustard. Perhaps this is the secret fuel that is propelling me to my best running ever? Or in reality, haul a horse up to the vet clinic today. During my hiatus from college, I somehow ended up working for nationally known Arabian horse trainers and driving rigs like the one above up and down the West Coast and Canada. It is almost like riding a bike, a really, really long bike as i hopped back into the driver seat after a few years. But there is nothing quite like rolling down the highway in a big rig. (1) Training has been going really well. No major injuries so far, but the hardest training is coming up with weeks of mileage I have never done. (2) I have tried to get on my bike a few times a week to help faciliate recovery and give my legs a break, but it has been minimal so far. Only 65.26 miles/ 4 hr 23 min in the 8 weeks so far. I would like to get 2 rides a week from here on out. (3) Sporadically, I have done my yoga and some core work. Again, another spot I need to focus on. 43,800 hours or 5 years. Today marked mine and Dirrty Girl's 5th anniversary of wedding bliss. There would be no Las Vegas this year or overnight trip to Canada, rather we settled for the kids spending a night at grandma's (YES!! ), dinner @ Vicente's Cuban Cuisine, throwing a few dollars around at the casino, and stopping in @ Oberweis. To think it all began when i walked into her classroom trying to find the teacher assigned to be my supervisor during my student teaching. The schedule called for 24 today, but I thought if I am driving out to Kensington to run @ 6 am then I might as well as turn it into a marathon. My original plan was to run 3 loops of Kensington, which measures just over 8 miles, and then run a bit extra to get the marathon distance. However, just before 7 miles, on the first loop the bridge was getting worked on, so i had to double back to the car which got me to just over 14 miles. After loading up with some more fuel and grapping my waistpack i headed back towards Island Lake, out to the trails for a few miles and then back. A post run dip in Kensington Lake was well deserved. 1. Felt really, really good today. Pattern was run 2 miles and then walk 2 minutes the whole way. Legs never stiffened up, and i definetly had fuel in the tank when i was done. 2. Tried a new fueling strategy this morning. Ate the same Kashi Go-Lean Waffles with PB and Nutella and a couple of strawberries and coffee pre-run, but did not take in any GU until 14 miles and then again @ 20 miles. Supplemented that with Gatorade and the stomach felt fine with no bloating or fullness that I start to feel at around 20+. Typically start eating 2 GU @ 6 miles and then repeat. 3. Only 6 minutes off of PB and that was with without any taper and a definite increase in mileage following this plan. I think this plan might actually be working!!! A term used when something is to old to be useful and it's best days are behind them. I had been looking at my Air Max Moto's lately and feeling that the cushioning, the bounce was just not quite there anymore. A quick scan of my mileage on the shoes, and I was indeed correct. Approaching 350 miles, I took them out this morning for a farewell 10 miler this morning. With a spin through the washing machine, they will move on, donated to our local church. Looking like we know what we are doing! They don't call me little dirt dawg for nothing! Part of this morning's 20 miler found me rambling through Wild Wood Hills Pathway. A scenic trail that blended gnarly singletrack, wide open double track through the forest, fields bristling with knee high grass and deer jumping off the trail. Not to shoot my fun wad on a long run alone, but with Buzzkill and Sleeping Bear in town for a few days, we declared it "man day" and loaded up little dirt dawg and headed over to Avalanche Bay(www.avalanchebay.com) for a day of Vertigo and Super G slides. .Legs Inn (www.legsinn.com) is located in Cross Village, MI at the end of scenic M-119 " Tunnel of Trees" and is listed as a State of Michigan Historic Landmark. It is a quirky joint to say the least. A reminder that the dive we were at last night is not a historic landmark...but damm if that za didn't taste good this morning following a 10+ miler. Anyways, Nina, our college student from Poland, quickly took Dirrty Girl's orders for pierogis and potato pancakes while little dirt dawg and I plunnked down some quarters into a viewing machine to try and get a sweeping view of Lake Michigan. You have a baby @ the bar? Getting ready to shove off with our rented pontoon boat for the day, we inquired the owner of a good place to dock and get some grub. Spotting litte dirt dawg and knowing his little sister we would be picking up, the owner said "Pinehurst Inn, but it can get pretty rough". After a day of fun, we docked @ the Pinehurst Inn, who looked like it had seen better days, but certainly looked like a dive. And we love a dive, a place where the locals hang out, you can get frosted mugs, a damm good pizza and where your checks is on a torn piece of notebook paper and they don't take credit cards. Little dirt dawg even managed to make friends with a couple of locals who let him watch them play pool after which they commented what a nice family we had even with a baby @ the bar. So after you done with the The Cross in the Woods, head over to the Pinehurst Inn for a real taste of the town. There are two things that Dirrty Girl looks forward to on any road trip: large animals(elk, whales, moose) and roadside religion. So imagine her luck when we rolled right past The Cross in the Woods on our way to the cabin. According to the brochure she brought back, it is one of Michigan's best known and loved monuments? Cut from a redwood tree in the mountains of Oregon in 1953 and completed in 1959, millions have visited. Not my cup of tea, but if you are on your way up north it might be something to check out.
" I would like to take my 3 yr old son fishing," I say to the gruff old guy at the local bait and tackle store in Indian River this morning.
" Got a boat?" he replies. Heck no...i mean do you know how much running gear I could buy with that I say to myself.
" uh no" I reply. "well, you can really only fish down at the pier" and with that he gave me some directions and sent us on our way. Down at the pier, little dirt dawg turned into " worm boy" and with some fumbling on my part we were able to cast out a few lines and even managed to catch a couple of small fish, and I repeat small. No matter to him, he was able to tell Dirrty Girl that the fish he caught was as big as his wingspan, a whopper of a tale. A term used by Michiganders to define their vacation spot within the state that is typically north of Flint, home of the Flint-stones and Roger and Me. Unlike the last vacation where we traversed over 250+ miles to our destination and made our way across, MI, OH, and finally to PA, this time we will be headed up north to Indian River for seven days. Never been there before, and not sure what awaits. Fueled by Chicken Nachos and copious amounts of Summer Zest @ the local watering hole with friends last night, I ventured out this morning with my pretty in pink coffee mug to meet up with Fritz for a run through Pontiac Lake Recreation Area. Fritz and I had never run, hell had never met until this morning, but it proved to be a great day for a trail run on his local stomping ground. Having not run trails nearly enough this year, I found him flying down the hills and me tripping a couple of times, smacking my right big toe pretty good, and at last count, 5 scrapes and 2 thorns I pulled out of my leg from jumping off the trail to avoid the ipod listening mountain biker. Comparing data from his Garmin 305 and my Polar RS200SD yielded 9.8 and 10.25 miles respectively, with the trail legend saying 11 miles, and somewhere in between being the miles we covered. In any event, I was stoked to get out and get some trail running in and meet a fellow runner. It was too damm hot out today. 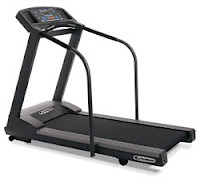 So instead, I hopped aboard my trusty, and unused since the weather turned nice, Pacemaster Platinum ProVR Treadmill for a jaunt on the Appalachian Trail. I forgot how cool this treadmill is. During the 4.5 mile, 45 min jaunt, the speed adjusted to 6 m.ph. , the Constant Effort Compensation Mode kept adjusting from a 4.5% incline to -2.2% decline every so often that I had to look at the control panel to see that indeed I felt like I was running downhill, because I was! Luckily, the weather is supposed to break tonight, bringing cooler temps and a return to the outdoors. Today, I registered for the Phedippidations Worldwide Half Marathon which is the brainchild of Steve Runner, a self deprecating man with a goofy little podcast you have heard me mention on several occasions. Being the director of the NR Fun Walk/Run Series, I think this Worldwide Half Marathon is genius because it is not only FREE, but gives a chance for people all over the world to run an event together. Locally, I will be working on putting together an event at perhaps Island Lake on the trails to give fellow participants a local event to gather and run. If anyone is interested in running it, please feel free to drop me a comment or email. Cause it's a sweep!!! Red Sox Nation rolled into the "D" this weekend and left as losers of 3 straight. How much was it again, just to talk to Dice-K? As a young boy, I grew up watching the Red Sox, since I lived in the littlest state in the union, but since moving out here in 1985 with my dad, i have since become a Tigers fan. I never made it to the vaunted Fenway Paark and about the only things i miss about the east coast are Dell's and clam cakes and chowder! Making it our annual tradition, my dad and i enjoyed a wicked blast of summer heat and a scintilating game by the Tigers, sparked by Curtis Granderson's web gem, as they capped the first half of the 2007 season. GO TIGERS!!! Based loosely on the 1929 Bunion Derby, Flanagan's Run is a sweeping saga of the depths the human mind and body face as individuals race from L.A. to N.Y. in an attempt to win $$$ during the Great Depression. I found this book last year laying in the book swap section of the gym library at the RIU hotel in Playa Del Carmen, Mexico and read it within a matter of days and again during the summer as a prepared for my then ill fated, failed 50 miler. As I read it i thought, man, how can i complain about running 50 miles in 1 day, when these individuals are running 50 miles, day in and day out for months at a time? In the midst again of preparing for another 50 miler, I pulled it down from my shelf in the closet and began reading it again last week. The likes of Doc Cole, Mike Morgan, and Kate Sheridan all make my struggles to get miles in seem paltry at best even if it only fiction. Never mind, the real life account of winner Andy Payne in the 1929 Bunion Derby. Only a couple of days later, Runner's World appeared on my porch with low and behold, an article on the 1929 Bunion Derby. Not sure what the message is in all of it except that I should have no complaints about getting out there and putting in the miles in preparation. So get out there and run, RUN! Decisions, decisions as i thought about where to run today. Kensington or Stoney Creek Metropark were my two choices (they both open @ 6 am as opposed to 8 am for the state parks and where i would rather run ---TRAILS, but the plans today did not allow for it) and I really didn't have any preference heading into this morning. However, as I got into the car and had to make a choice which way to head out I had a small epiphany. Now, I have purchased a heart rate monitor to make sure my easy runs are truly easy and my hard runs are hard, monitor my fluid and fuel intake, why shouldn't i also take the advice that you have to train yourself for the conditions that you will run on as well? That being said, I headed out to Stoney Creek and started off on a 21.26 mile run that mixed both road (12.61 mi) and trail (8.65 mi). I know the North Country Trail Run is all on trails, and with the family headed up north next week i should be able to start doing some more trail work. I try and save listening to my Ipod nano (actually the wife's) until I have a couple of hours under my belt, kind of like a reward, and give myself a bit of time to think to myself. Should have had paper with me. (1) Why do mountain bikers not say thank you when you get out of their way on the trail? (2) Has anyone ever been attacked on trail by a deer? i was lost in thought on the trail when i came within 6 feet of a deer munching on some grass. Probably what caused my heart rate to climb to 169 or a couple of the big hills. (3) Nike Air Max Moto IV good for roads and smooth trails. Not great for some of the technical trails @ Stoney. (4) New GU combination of Chocolate Outrage and Orange Outburst is Yummy. (5) Why if you spend thousands of dollars on a tri bike, can you not spring for a jersey to wear? I mean if you go down...ouch...and the dude was hairy! (6)Leave no trace!!! I saw too many gel packets lying on the trail today. Since i couldn't figure out how to attach pics as i was mobile blogging in PA with my Treo 680, here are a few pics(Cannon PowerShot A540) from the trip. Makes you hungry doesn't it? I tried to rush back and get a picture of a horse and cart actually parked there, but I was too late. Go Seawolves. Justin Verlander, Curtis Granderson, and Joel Zumaya all played here. Can't think of a better way to spend a summer night than with the family at a ballgame! Take me home, to the place I belong (tomorrow!!). With the help of the internet prior to departure, I was able to find a country road that was only a mile or so down the busy highway. Ambling along for an easy run today found me out amongst rolling hills, an Amish horse and buggy passing me and the first mosquitos of the year. On the way back, this cute dog came barreling towards me, complete with owner yelling " Don't worry he's friendly," which always puts me at ease. Cutest mutt I have seen but the owner corrected me and said he was a pedigree stray. Guess even with a dog there is some degree of political correctness. Nice little day actually. Gathered up the entire family, and I mean the entire family (less than 2 days until we go home, I will try and hide my excitement), and headed up to Presque Isle for a day of running and sun. While the family played in the sand to begin the day I headed off on a well marked, safe, and flat bike path for a 6 mile tempo run. After a day of sun, Dirrty Girl and I again headed out for a run which was my recovery and her speedwork for the week which she did a good job. Based on the vacation spent with family, I would like to nominate Yuengling, as my Featured Beer. AARGH!!!! Rounding out our week of baseball found us @ PNC Park in to see the Pirates. Little dirt dawg has shot his fun wad for the wknd so dirrty girl and I solidered on to enjoy a great park with even better food (sorry Tigers) and the seat nazi. As for my bender, a 9.6 miler around the lake sounds great but running on a busy highway is not the safest thing, but I did get my fix for the day.